Step 1 Remove and discard the husks from the tomatillos then wash them under running water. Combine the tomatillos and water in a saucepan. Bring to a boil and simmer until the tomatillos are tender, about 10 minutes. Puree the tomatillos with the cooking liquid and set aside. Step 2 Coat a nonstick skillet with cooking spray. Add the oil and heat over medium-low heat. Cook the minced garlic, onion and chile in the oil until tender, 1 to 2 minutes. Stir in the tomatillo puree. Bring to a simmer and cook until the puree thickens slightly, about 5 minutes. Season with salt to taste and the lime juice. Keep the sauce warm while preparing the chicken. Step 3Heat a well-seasoned grill pan or outdoor grill to medium-high heat. Step 4Season the chicken breasts with salt and pepper. Sprinkle the cumin evenly over both sides of the chicken breasts and rub over the surface. Rub the chicken breasts with the cut sides of the remaining clove of garlic. Lightly spray the chicken with nonstick cooking spray and grill, 5 minutes on each side. Step 5Meanwhile, heat the oven to 350 degrees. Step 6Place the grilled chicken in a small baking dish and cover with the warm tomatillo sauce. Top each of the chicken breasts with the cheese slices. Bake until the chicken is no longer pink in the center, 15 to 20 minutes. In Recipes-list.com we have selected the most viewed recipes from category - Grilled Healthy eating Main courses Quick and easy . Enjoy the best recipes specially selected for you! 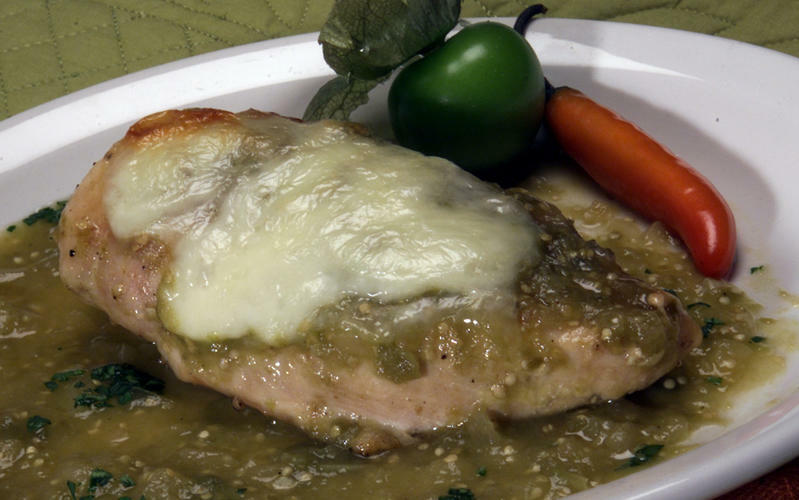 Baked tomatillo chicken is the right choice that will satisfy all your claims.